This is a very useful post, I’m trying to design a card for Philofaxy at the moment. One idea is to punch the card with 3 holes, so it will slot in to a Filofax! Not original I suspect, but practical. Thank you, Steve! I like the idea of the punches. 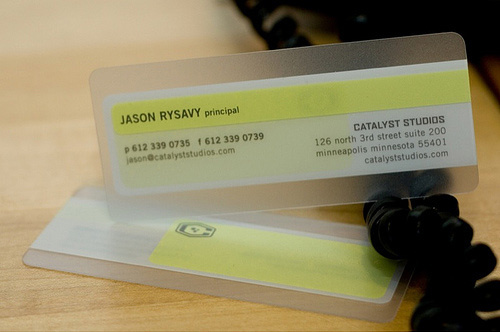 Can you print it on a plastic material, such as Priplak, semi transparent so it feels a bit like an insert section? That’s an interesting idea, but I would have to find a firm to do it. I’ve been looking at firms like ‘Moo’ and Vista print for ordinary card ones. I got my cards and they look great! I kept design and the details on the reverse very simple and straight forward. Loved the cards, thank you! The design is apt for your blog and different from the box standard formats, so great choice! Thank you. They have been well received in all quarters I’ve sent them out to!